Travelling from Starigrad to Knin took me a day, but I got to see the beautiful old town of Ŝibenik and in Knin I checked in at a hotel at the outskirts of the town, close to the trail. Since it’s really, really warm out here I decided to leave the hoteat dawn. After hiking for about an hour I crossed a dirtroad, just at the moment an old truck came slowly, driving uphill. In it, I learned, were the beekeeper and his two friends. Since they were driving all the way up to Brezovac, where I was heading too, I had to get in truck. No discussion! So as I sat, like an outdoor princess, on a plastic chair next to the beehives enjoying the early morning views on the surrounding mountains, I was slowly driven up to Brezovac. 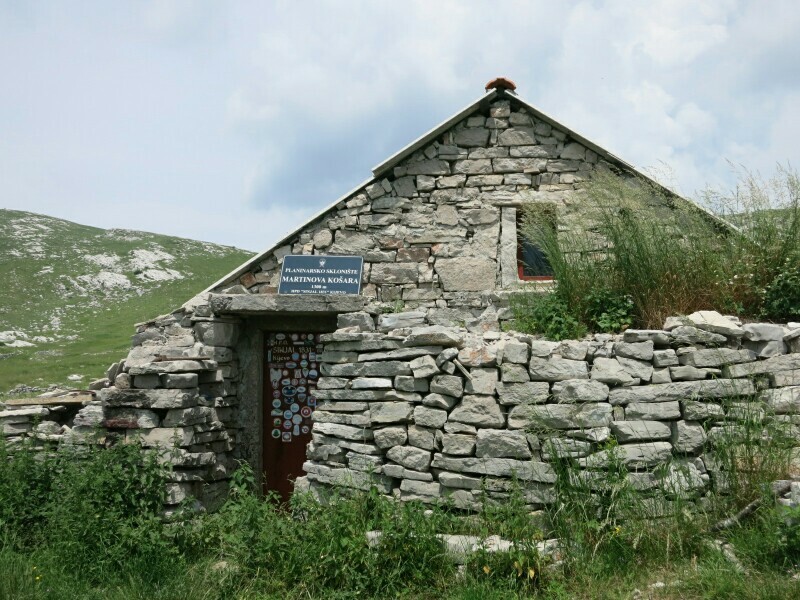 There were no other hikers, so Brezovac mountain hut was closed (it’s only open by arrangement). There’s some nice, shaded campingspots near the hut. But, don’t count on getting water from the cystern: it’s locked! As I wasn’t carrying enough water to hike the Dinara on this very warm day, I tried my luck at some holiday houses closeby. No one was in and there was no outside access to water. As one house was being renovated an old barrel stood outside, from which I took water. The next cystern is at the other side of Dinara at Skloniŝte Martinova Koŝara – so hopefully the cystern at Brezovac will be unlocked for thru-hikers! The hike to the top of the Dinara is quite easy; the trail being very exposed is the only hard part. After a short break, the rumbling sound of thunder made hike down as fast as possible. This from, the outside nice looking, shelter is kind of a mess inside; lot’s of flies and bugs and critter droppings. The good thing about this hut is the earlier mentioned cystern nearby. Since of the mess, the threatening thunder and the exposed surroundings I decided to hike to Glavaŝ. On trail at a 1000 meter there’s Gurnji Bunae a surprise spring with fresh water coming straight from the mountain, yumyum! Just before Glavaŝ there’s the impressive ruins of a 15th century fort. I only took a short break, since of the weather. As I arrived a Glavaŝ it started to rain. The door of the hut (container) was closed, so I pitched my tarp as quick as possible. Just as the thunderstorm started I lay under the tarp, a big storm it was including hail as big as M&M’s. Later, when it stopped raining, I discovered a second door in the hut. This one’s open and in it an pretty OK space containing bunk beds. The next morning I hiked eight kilometers to the road and village of Kijevo. There were supposed to run some busses, but after waiting for 2.5 hours and no bus showing up, I decided to hitch back to Knin. From were I travelled by train to Split. The next two stages biking trails over paved roads instead hking trails. So after buying a new pair of trailrunners and other supplies I’m taking a bus from Split to Tomislavgrad in BiH. After getting loval cash and a simcard I’ll get back to trail at stage 27. From here, hopefully, no detours except for resupplies until Albania.